SpaceX is headed to capital markets again, this time seeking $500 million in equity funding. While the company's rocket launches garner headlines, low margins and emerging competition make it an unattractive business. SpaceX's real profits are supposed to come from a constellation of small satellites, dubbed Starlink, that would provide internet to customers worldwide. Behind schedule and slated to cost billions, COO Gwynne Shotwell has recently suggested that Starlink may end up getting scrapped entirely. Without the prospect of Starlink, SpaceX's valuation becomes totally unsupportable; investors may be in for a rude awakening as promised profits disappear over the rainbow. SpaceX (SPACE) has been at the forefront of the commercial space industry for years. Its rockets carry government and commercial satellites into orbit and have even delivered supplies to the International Space Station. But this is just the beginning, according to founder and CEO Elon Musk. He claims that, within a few short years, SpaceX will carry humans into space, first to the moon, and then Mars not long after. While it costs nothing to dream about a future Mars mission, actually undertaking one will. For years, SpaceX has promoted the idea that Starlink, a proposed constellation of as many as 11,000 small satellites, will fuel the company’s broader vision by providing broadband internet coverage to customers all over the world. Thus, Starlink has been a key part of SpaceX’s growth narrative. Yet, according to recent company comments, Starlink might be getting the ax. That could mean serious trouble for SpaceX’s mission and for any hope of significant profit in the future. According to a study published by the National Research Council, a manned Mars mission would carry a hefty $220 billion price-tag. That is a bit out of SpaceX’s price range, to say the least. Since 2002, the private company has raised $2.4 billion from investors across 21 funding rounds. SpaceX’s only meaningful source of operating revenue is launch contracts, with the U.S. government, its dominant customer. 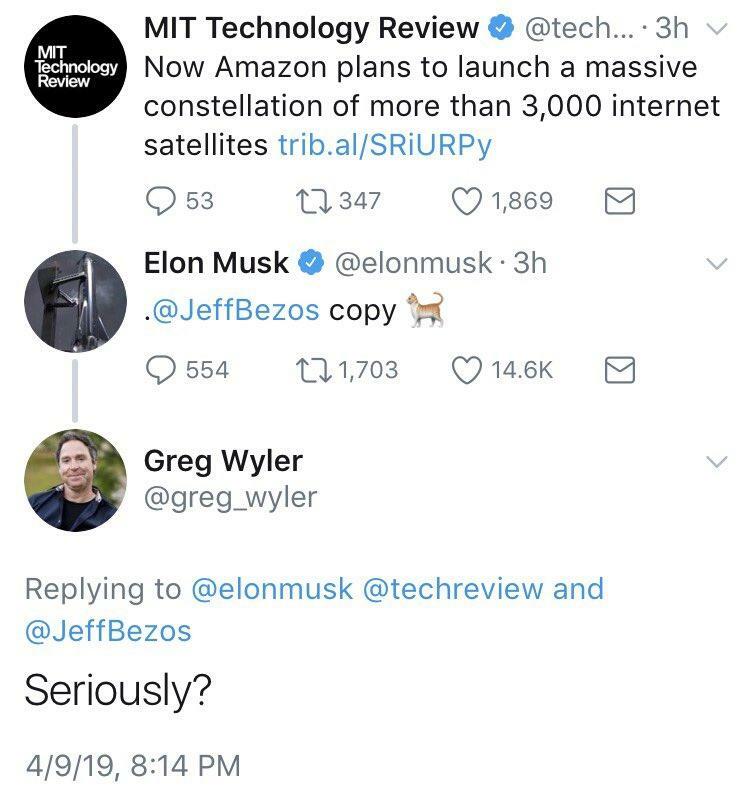 Yet, for all its efforts to make launches cheaper, margins are still tight, and SpaceX remains unprofitable. 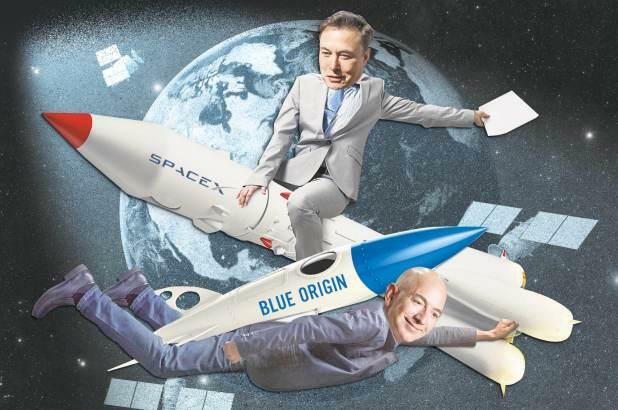 While still a few years away, a host of new competitors, such as Jeff Bezos’ Blue Origin, will put further pressure on SpaceX’s bottom line. SpaceX is well aware that launching satellites for government and commercial customers can neither provide the cash necessary to fund its loftier ambition of manned space exploration, nor justify its eye-watering $30 billion valuation. That is where Starlink comes in. The first satellites are meant to be operational by next year, with aggressive expansion to follow. 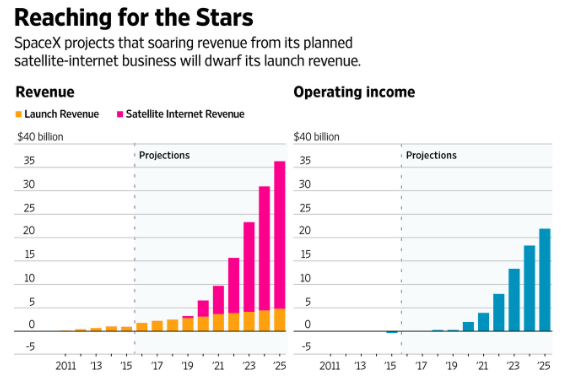 In 2015, SpaceX estimated that, by 2025, Starlink would be generating $30 billion in annual revenue from 40 million subscribers. Without Starlink, SpaceX would be just one more capital-intensive space launch business facing stiffening competition, hefty operating losses, and an uncertain future. That is a far cry from 2015 and its promise of endless profits. It is doubly strange to make such an admission in the midst of yet another capital raise, which aims to bring in up to $510 million from equity sales valuing the company at $30.5 billion. Adding to Starlink’s troubles is the emergence of competitors in the satellite internet space. Amazon (AMZN) recently announced its intention to launch its own constellation of more than 3,000 satellites that could end up competing directly with Starlink. When the news broke about Amazon’s plans, Elon Musk demonstrated his usual bravado, accusing Jeff Bezos of being a copycat. Bezos has already scooped up a number of ex-SpaceX engineers, including several top Starlink managers who Musk had fired, reportedly due to their slow progress. Given that Starlink could cost as much as $10 billion to complete, pricing competition of any kind could prove disastrous to expected margins. With Starlink now in jeopardy, SpaceX’s future appears more precarious than ever. Investors in the company, either directly or via mutual funds, cannot afford to ignore this latest revelation. Without Starlink, there is neither a path to sustainable profitability, nor a credible justification for SpaceX’s aggressive valuation. SpaceX was always a risky proposition from an investment perspective. With Starlink’s future in doubt, it is downright foolhardy to make a bet on this company.